Choose lift and slide when no other product will do. 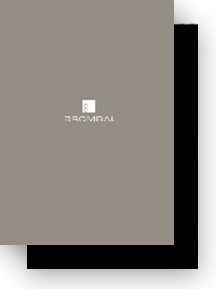 Brombal lift and slide doors are ideal for unobstructed views along with thermal efficiency. Thermally broken; this product is one of the most energy efficient sliding door systems on the market. Wide variety of hardware options available including the standard multipoint locking system, and various styles of handles and finishes. 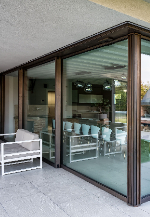 Brombal lift and slide doors are available in a wide range of materials, including galvanized powder coated steel, stainless steel, Corten, brass for a bronze aesthetic, and wood clad. A bi-metal option is also available utilizing a combination of the available materials, one for the interior and one for the exterior. The number of panels can be chosen to suit any particular configuration and opening size. The size of the door is only limited by the hardware used to operate the unit. For massive sized units, motors are available. Heights may be up to 20’ tall and 15’ wide. The size of our Brombal lift and slide doors is mostly limited by the glass size. The manual hardware used on these doors can accommodate 880 lbs per panel. Dual rolling systems can be used to accommodate larger pieces of glass exceeding 880 lbs to achieve an even larger door. Motorizing the units provides almost limitless options. Heights achievable up to 20′ tall and 15′ wide. Inquire about specific details on extra large openings. Please inquire directly about handle options and custom hardware availability.